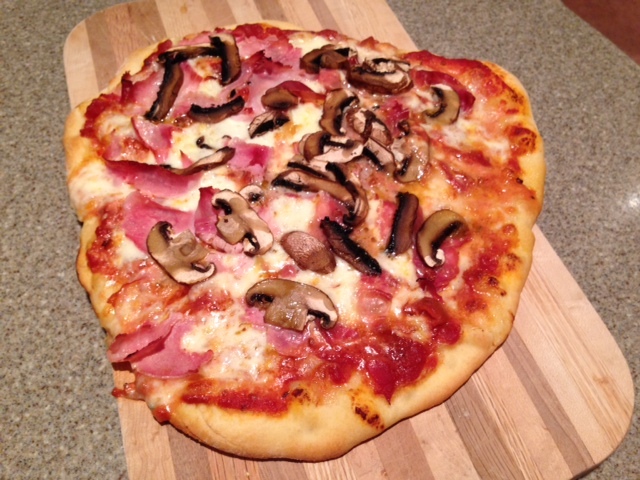 Cooked pizza with tomato sauce, mozzarella, ham, mushrooms. Your oven must be able to hit 450F degrees; 500 or 550 is even better. It helps if you have a restaurant-style pizza stone ($9) for the oven and a basic wooden pizza peel (all of $7) that you’ll use to slide the assembled pizza onto the hot stone to cook. (After two expensive gourmet-store pizza stones cracked, I finally bought a $9 pizza stone from a restaurant supply store in Chicago. I keep it on the bottom rack of the oven all the time, and move it up to the middle to make pizza. It’s lasted more than 10 years.) If you don’t have a pizza stone…well, I’ve seen people use the flat bottom of large, upside-down cast iron skillet or griddle. As long as it’s been preheated in the oven. Dissolve yeast and sugar in 1/4 cup warm water. In a separate (large) bowl, mix the salt into 1-1/2 cups of the flour. Add the remaining 3/4 cup of water to the flour mixture. When the yeast begins to foam a bit, add it to the flour mixture. Stir vigorously, and add the rest of the flour. Turn the dough onto a floured board and let it rest (safe from cold drafts) while you clean the bowl. When the bowl is clean and dry, rub the interior with a light coat of the olive oil. Knead the dough continuously for 15 minutes, adding flour as necessary (up to an additional 1/2 cup of flour, even 1 cup if you feel confident of your ability to judge doughs), to create a silky dough. Return the ball of dough the bowl, roll it around to coat it with the oil, then cover bowl with two tight layers of plastic wrap. Let it rise in a warm (but not hot) place until double in bulk, about 2-3 hours. Punch down the dough, divide in half, wrap the halves in plastic, and refrigerate for at least 2 hours. 24 hours is ideal. When you are ready to make pizza, preheat the oven, with the pizza stone in it, to 450 degrees F — or, if your oven is capable, 500 or 550 degrees. While the oven is pre-heating, take out one of the dough halves and place it on a floured board. Pounding with the heel of your hand (or using a rolling pin), work the half into a pizza about 12-inches in diameter. (Of course, you could lightly flour your hands and spin the dough in the air until until it is 12″ in diameter. If you try this, be prepared to get a light shower of flour all over your kitchen.) Note that New Haven pizza does not have a gigantic outer crust. So feel free to stretch the outer rim of the dough. It will puff up a bit on its own in the oven, just because it doesn’t have toppings on it. After it’s on the peel, brush the dough lightly but thoroughly with olive oil and then add your sauce and toppings, with a light touch. (My lecture on hand-crushed San Marzano tomatoes as opposed to tomato sauce will be delivered at another time; all I’ll say here is that if your sauce or tomatoes are too watery, use a strainer first. You don’t want the dough to get drenched.) If using plain canned tomatoes rather than an herbed sauce, finish with a sprinkling of dried oregano. 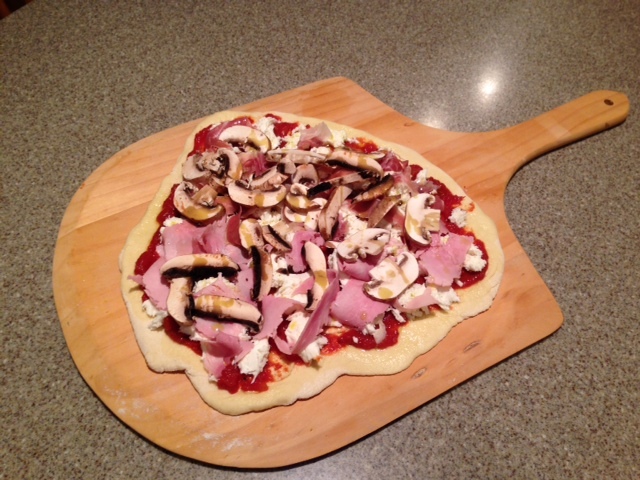 When the oven is ready, slide the pizza from the peel or sheet onto the pizza stone in your oven. Bake 15 minutes or until the underneath of crust is light brown. Remove, slice and serve. Repeat with second ball of dough. 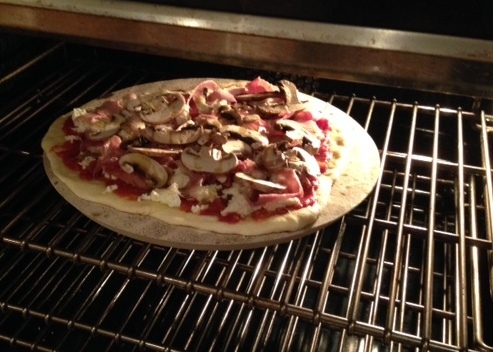 This entry was posted in Cooking, Food and tagged New Haven pizza, Pizza, Pizza stone. Bookmark the permalink.